A hypertensive crisis is a quick and severe risk in blood pressure that can lead to a stroke. Extremely high blood pressure refers to readings of 180/120 mm Hg and higher and it can cause damage to the blood vessels. When blood pressure is this high, the heart is unable to pump blood efficiently. For these reasons, it’s important to address hypertensive crisis immediately in order to reduce the risk of stroke or other heart-related events and complications. A hypertensive crisis may present as a hypertensive urgency or hypertensive emergency. Hypertensive urgency is when blood pressure readings are over 180/110 mm Hg or higher, but there is no associated organ damage. A change in medications is required in hypertensive urgency and it may not result in hospitalization. A patient will need to be evaluated by a medical professional, though. Hypertensive emergency is when blood pressure is so high that it causes damage to the organs. 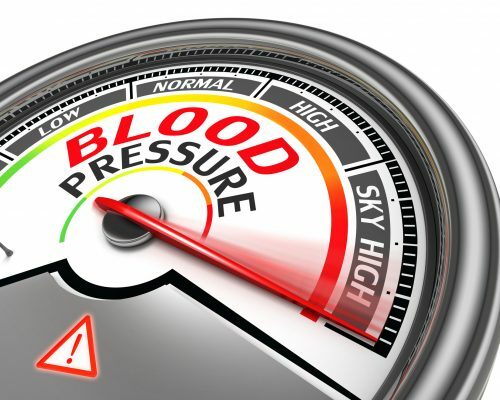 Hypertensive emergency is a blood pressure reading of 180/120 mm Hg or higher, but can occur at lower readings in someone who does not normally have high blood pressure but experiences a spike. In a hypertensive emergency, there is a higher risk for stroke, loss of consciousness, memory loss, heart attack, damage to the eyes and kidneys, loss of kidney function, aortic dissection, angina, pulmonary edema, and eclampsia. Common causes of a hypertensive crisis include forgetting to take blood pressure medication, stroke, heart attack, heart failure, kidney failure, rupture of the aorta, medication interactions, and eclampsia. Symptoms of hypertensive urgency include severe headache, shortness of breath, nosebleeds, and severe anxiety. Other symptoms of a hypertensive crisis may include blurred vision, nausea or vomiting, dizziness or weakness, and problems thinking, sleeping, and behavior changes. Severe symptoms which can be life-threatening are severe chest pain, severe headache accompanied by confusion and blurred vision, nausea and vomiting, severe anxiety, shortness of breath, seizures, and unresponsiveness. Your doctor will first ask whether you have other conditions such as diabetes, high blood pressure, or heart disease. They will also review your medications and check your kidney, heart, and brain functions. Diagnostic tests for hypertensive crisis include blood tests, urine tests, an EKG, a chest X-ray, and a CT scan. Hypertensive crisis is commonly treated with blood pressure medications and diuretics. In order to prevent another hypertensive crisis, it’s important that you manage other health conditions such as diabetes or heart disease, take your blood medications regularly, eat a healthy diet, lose weight if you are overweight, exercise regularly, limit your alcohol intake, and don’t smoke.